01. What is Globalia Logistics Network? Globalia Logistics Network is not a freight forwarder. It is a global alliance of hand-picked freight forwarders in each major air/seaport who work together to grow their businesses, lower their outgoings, and thus become a match for the largest multinationals..
What standards must my company meet in order to become a member of Globalia Logistics Network? Globalia does not require its members to be the largest freight forwarder in their city. What GLOBALIA does require is for member companies to have strong management, be financially solvent, with a notable business volume, have a good credit history and a well-established reputation (must have been in operation for at least 2 years). Stage 1: You should complete the online Membership Application form. 2-3 days after submission of the application, you will be informed as to whether you have met our criteria and made it to the second stage. Stage 2: Your details will be sent to a third-party auditor, DUN & BRADSTREET who will audit your company, at Globalia's expense. If your application is approved by DUN & BRADSTREET a reasonable personalised credit limit will be set for your business. You will then receive an acceptance letter, a copy of the contract and your membership fee invoice. What is DUN & BRADSTREET and what do they check? DUN & BRADSTREET is a third-party auditor which rigorously examines the financial history of each applicant using information from their customer database and information already on public record. This thorough examination of potential members ensures that only those companies that pose no financial risk are granted membership. Furthermore, they provide a reasonable personalised credit limit for each member. To learn more about DUN & BRADSTREET, click here. What financial information does Globalia request? All Globalia members must meet minimum standards in liquidity and gearing ratios. See Rule 4.1.2.. We require the balance sheets* for the last two financial years in order to study your company in depth. * Balance sheets are only used to verify the financial stability of a company and are never disclosed to a third party. What is Globalia'S annual membership fee? All membership fees can be seen here. Tariffs differ according to the size of the market, the population, business volume and other factors in that territory. Can I join in more than one territory? Yes. Any member with branch offices in other locations inside the same country as its registered Head Office in the network may apply to be a member of Globalia there if the territories are vacant. Agents with branch offices will pay just 50% of the posted membership fee. Why are Globalia's fees higher than other networks? In short; the price is reflective of the service Globalia offers its members. Globalia allows just one agent per sea/airport, i.e. one agent alone is responsible for the traffic from/to that territory. Unlike most other networks, the territory will not be sold over and over again. Globalia has an extremely thorough application process. This is in contrast to other networks which work on a pay-per-admission basis. For every application that is accepted, 9 are rejected. Globalia absorbs the costs of each member's financial analysis by an external auditor, DUN & BRADSTREET. GLOBALIA is one of just two networks which uses the services of an external auditor. Providing an environment in which risk is reduced, whilst the opportunity for business growth maximised is no easy matter, but it is vital in order for members to be successful individually and as a group. Yes, Globalia has a referral programme. For every recommended agent who successfully passes the application process and becomes a member, the referring agent earns a 25% discount* on their annual membership fee. What is the start/expiration date of my membership? Your membership begins on the date your membership is announced to all members. On the same day we will give you your intranet login details. Your membership will automatically renew 1 year from that date*. What details should I provide for my member profile? What makes Globalia Logistics Network different to other networks? 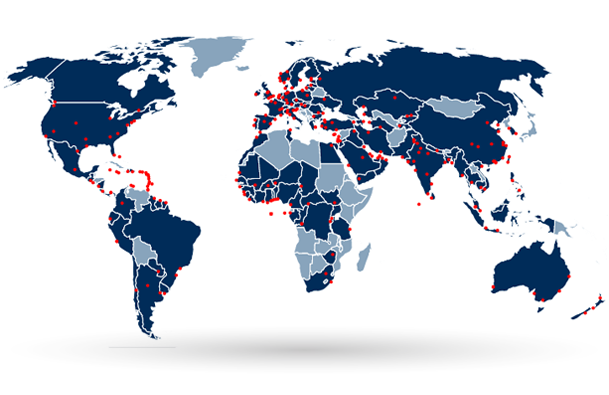 The network accepts only one agent per territory, i.e. this agent is solely responsible for the traffic from/to that territory. The majority of other networks allow an unlimited number of members per territory. Globalia accepts just one agent per sea/airport i.e. this agent is wholly responsible for the traffic from/to that sea/airport. The majority of other networks accept many members per sea/airport. Globalia has an extremely strict application process. Most other networks do not stipulate what criteria applicants must meet to be accepted into their networks. GLOBALIA, however, clearly specifies its criteria. Globalia absorbs the costs of each member's financial analysis by an external auditor, DUN & BRADSTREET. Globalia is one of just two networks which uses the services of an external auditor. Globalia carries out a biannual cooperation survey. Members who are found to be just taking and not offering shipments within the network are expelled and immediately replaced by an agent on the waiting list for that territory. Globalia's Agent Finder Tool gives each member clearly defined territories with no overlapping and no competition. Input the origin/destination and the tool will automatically provide you with the details of the closest agent. Our highly experienced team are always available to help members in any way they can both quickly and efficiently. You can find out more about the Globalia's benefits here. Company policy restricts the disclosure of members' details to non-members. However, visitors and applicants are invited to review our Testimonials page and contact those members to hear feedback on their membership. What happens if Globalia has no coverage in a particular territory? Head Office will provide details of companies in countries where there currently are no members. * We invite members who come across a reliable agent to refer them to Head Office, as they can earn a significant discount on the membership fee under the Referral Program. *Globalia accepts no liability for any financial loss or other losses that may occur as the result of working with non-Globalia members. Globalia does not hold current data on traffic per city/country. Do territorial conflicts ever occur within the network? Globalia is designed to avoid territorial conflicts between members. We do this by having only one freight forwarder per sea/airport. Then Globalia's territories are carefully delimited using our Agent Finder Tool. This tool automatically creates a territory for each member preventing overlapping. Will the other Globalia members send me their business? Yes. Providing a good service at a competitive rate, as the only agent in your territory you will be in a powerful position to receive inward free-hands, routings, sales leads, quotations, etc. from your fellow members and this will cause your business volume to increase significantly. Will I receive the same amount of business from members in return? Perhaps not from this member specifically, but in overall terms, you will be more than rewarded with business for your cooperation. Can Globalia assure me that I will receive enough business to cover the cost of my membership fee? No network, including Globalia, can guarantee business to its members because each market differs. GLOBALIA provides you with the portfolio of reliable partners as well as the secure environment and regulation framework you need for your business. The rest depends on the pro-activity and service of each member as well as the price offered. Members are committed to offering a substantial amount of shipments within the network. This is checked quarterly with our cooperation survey. Should a member be seen to be taking and never offering business, they will be expelled from the network and immediately replaced by an agent on our waiting list. Am I required to only work with Globalia's agents? No. We understand how difficult it is to find good agents and we would not want to jeopardize your existing relationships. This is why members are not required to use the network for 100% of their shipments. In addition, members are urged to recommend their favourite agents as candidates for membership in Globalia through the Referral Program. If they are accepted, the referring agent will receive a 25% discount on their annual membership fee and they can continue to work with them through the network. The optional Payment Protection Plan (PPP) protects its subscribers against losses attributed to uncollected debts from fellow members in the event of bankruptcy or insolvency. For more information, visit our PPP section. Members who resign from the network will be refunded their total contributions to the PPP fund, less: - 20% of this total, which will be retained by GLOBALIA to cover expenses anticipated to arise in respect of future claims, such as legal or debt collection costs. - The member's pro rata share of the total monies disbursed to meet claims made against the fund during the period of their membership. The refund -net of these two amounts- will be made by bank transfer during the first quarter of the calendar year. See Rule 6 A.2. Why and how does Globalia record cooperation within the network? All members understand the importance of mutual (giving and receiving) cooperation. Head Office requests members complete a short survey where they inform us who they have worked with in the network. This survey is biannual. This information lets us know who is taking but not giving business. What happens to members who fail to offer shipments to their fellow members? Should the cooperation surveys provide evidence that a member is operating as a fishermen, that member will be warned and encouraged to improve their working practices. Should said behaviour continue, they will be removed and an agent from our waiting list will be appointed. What happens if my company does not form a good relationship with a particular Globalia member? If the relationship fails due to poor service on the part of the other agent, Globalia Head Office should be informed. If this is not the case, you are welcome to use another agent in the same country or one from outside the network..
What types of behaviour can lead to expulsion from the network? Undertaking practices deemed to be dubious, providing poor service or failing in its responsibilities to other members. Neglecting in its promise to cooperate with other members. Persistently late in making payment of invoices by other members. Not paying invoices issued by other members. Not attending two consecutive annual meetings. Not actively contributing to sales promotion. Operating with bad faith in a dispute with another member. Persistently violating any of the other rules. What are Globalia's standard payment terms? 30 days is the standard payment period between members, excluding VAT and taxes that will be paid immediately without credit terms. The payment guidelines are set out in Rule 9.
Who should pay the bank fees? The fees will be split between both parties. When making a payment, the agent ordering the payment should choose 'SHA' so that all bank fees are shared. What currency should an invoice be paid in? The agent making the payment should pay in the currency stated on the invoice. Other currencies may only be used when both parties have agreed so in advance. What should I do if a member is late paying an invoice? Globalia will not tolerate late payments; it is not the job of busy forwarders to collect outstanding payments. Should this situation occur, the affected agent should contact Globalia Head Office immediately and the late payer will be contacted and given 5 days to make the payment. See Rule 9.8. Is attendance at GLOBALIA'S Annual Meeting compulsory? Globalia requires all members to send one senior member of their team to its annual meeting. Any company which fails to be represented at 2 consecutive meetings will be expelled. How can attending the annual meeting benefit my company? The annual meeting is by far the biggest benefit membership of Globalia offers. It is the annual moment for members to promote their businesses internationally, agree deals and form long lasting relationships. Developing a world-wide network of trustworthy and reliable agents can be a very costly task both in terms of time and money which often results in failure and let downs. This conference is the answer, as you will be able to meet all the senior staff in our members companies in one place at one time for one price; thus, saving you substantial time away from the office and considerable expense. What happens at Globalia's Annual Meeting? The 2 and a half day event begins with an opening cocktail party where members get together and catch up in an informal setting. The following two days consist of 32 one-to-one meetings which are pre-booked by members via our online one-to-one scheduler. In addition to the cocktail party, we also enjoy a gala dinner together. To find out more about Globalia's Annual Meetings, click here. Is displaying the Globalia logo compulsory? Yes. The Globalia logo should be placed alongside each member's own logo in communications with customers, suppliers and the public in general, in places such as on email auto-signatures and websites. This is to demonstrate their membership of the network and to promote the brand. See Rule 12. Where can I find the Globalia's brand manual and logo? The Identity Manual can be downloaded from the members only intranet. In it you will find all the information you need to upload the logo. Simply login to the Members Area and click the green arrow with “Download” next to it which you will find in the right-hand corner. You are now in the download area and you should see a banner which says "Globalia", click this and your download will start immediately.